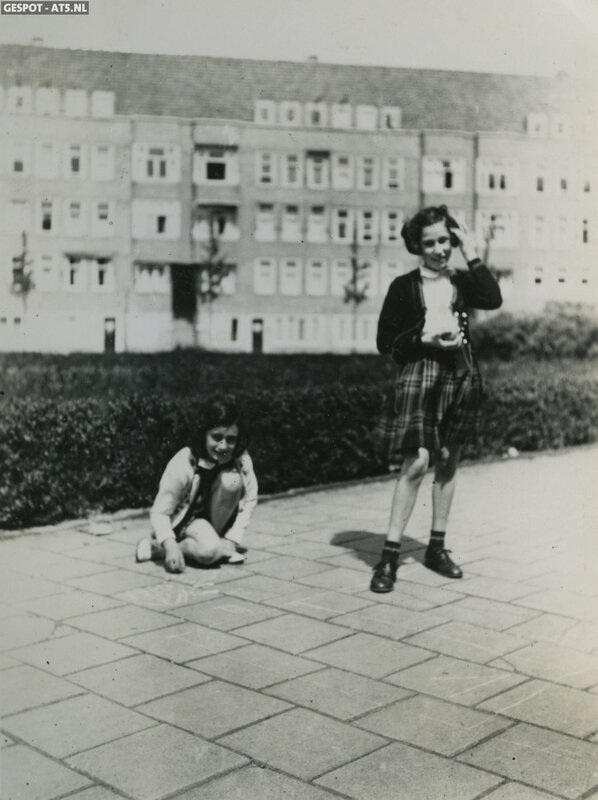 In the summer of 1942, shortly before Anne Frank and her family moved into the secret annex on the Prinsengracht Canal that would be their entire world for two years, Anne approached her neighbor and playmate Toosje Kupers to ask her for a favor. Anne was concerned that her treasured marble collection would fall into the wrong hands, so she asked Toosje to keep them for safe until her return. She also gave Toosje a tea set and a book she had gotten for her 13th birthday for safe-keeping. The Kupers family also agreed to take in the Frank’s cat Moortje, although to perpetuate the ruse that they had quickly fled the country, they left the cat behind in their home and the Kupers pretended their decision to adopt her was spontaneous. As we know, Anne never did return. She and her family were betrayed and on August 4th, 1944, they were arrested. Anne and her sister Margot died of typhyus at Bergen-Belsen in March of 1945. Their mother Edith died in Auschwitz. Father Otto Frank was the only survivor. He made it out of Auschwitz alive and returned to Amsterdam to look for his wife and daughters. By the summer of 1945, Otto knew that his entire family was dead. Toosje Kupers had kept her promise to Anne. The marbles, tea set and book were still safe. She offered to return Anne’s treasures to her father, but Otto Frank told her to keep them. And so she did, for decades, eventually forgetting that she still had them. Toosje rediscovered Anne’s things in her attic just last year when she was packing up to move. She contacted the Anne Frank House Museum and offered to donate the precious artifacts of Anne’s childhood to the museum. The book and tea set have gone on display in the year since their rediscovery, but the museum has been saving the marbles for a special occasion. The colorful set is part of an exhibition called The Second World War in 100 Objects that was officially opened Tuesday by His Majesty King Willem-Alexander of the Netherlands at the Kunsthal Rotterdam. The 100 objects come from 25 Dutch war and resistance museums and give members of the general public. They include the spectacles worn as a disguise by Dutch resistance fighter Hannie Schaft; a folding motorcycle that literally fell out of the sky during the parachute drops of Operation Market Garden; a decoy paratrooper dummy (known as a “Rupert”) used by the British to deceive the German troops; the grave cross of American pilot James M. Hansen, who lies buried at the Netherlands American Cemetery at Margraten; and a sweater made from dog’s hair during the “hunger winter” of 1944-45. 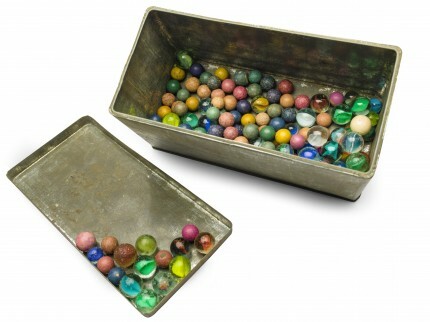 The marbles fit right in as poignant symbols of how Anne Frank, despite the extraordinary circumstances of the last two years of her life and her great writing talent, was still just a little girl who collected colorful marbles and kept them in a tin box. 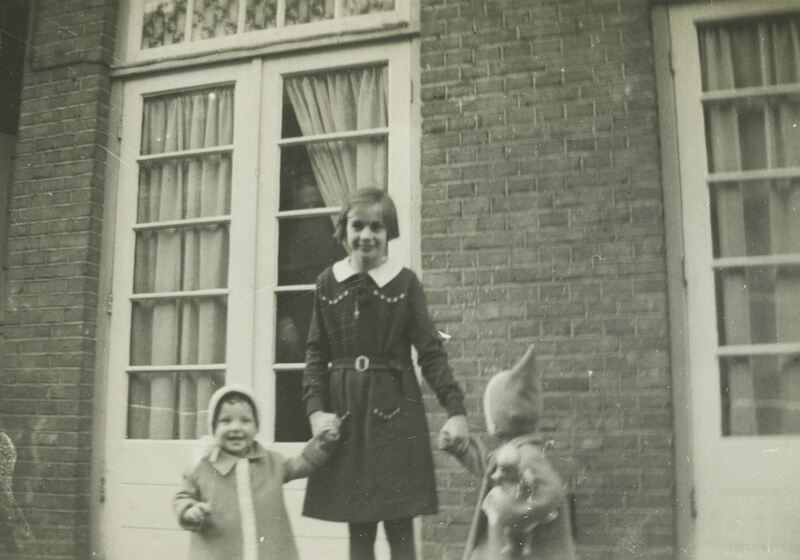 [Teresien da Silva, head of collections at the Anne Frank House museum,] said Frank was one of many Jewish children who gave away their toys before going into hiding or being deported. “For children during that time, marbles were a treasure. They worked very hard to win them,” she said. While the marbles are old, she said, they are in good condition.